A vision board is a simple collection of images and words around a goal you have. Seeing this board every day helps you stay focused on your goal. What we focus on gets better! Financial Freedom is a goal shared by many people for a great reason. It means more time on your terms! 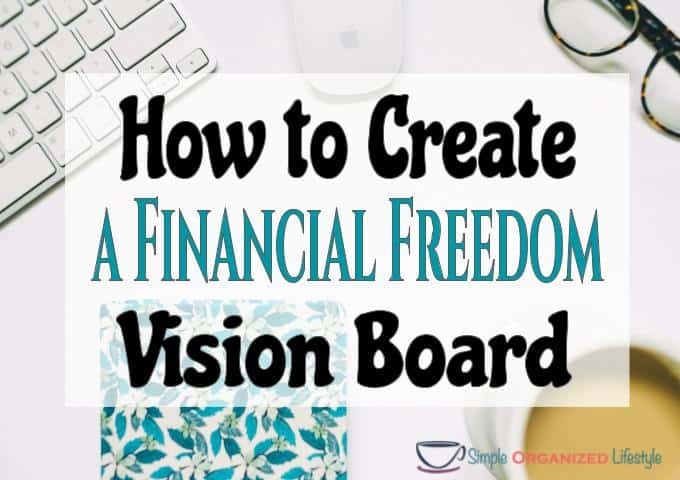 If you also share this goal, making a financial freedom vision board is simple to do and a great way to help you stay focused. Images are easy to find and print online from sites such as Unsplash, out of magazines, or use your own pictures that remind you of your goal. Words can also be easily created and printed from your computer in Microsoft Word or PowerPoint. 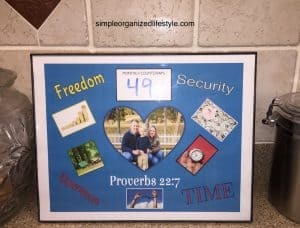 Some people prefer to have a vision board made completely of words, which is easy to do for free at sites such as Wordle. Once you’ve collected your images, simply glue them onto the piece of card stock and place the completed visual in the frame. Put this frame in a place where you will see it daily. The great thing about a glass frame is you can easily write on it and wipe it off with a dry erase marker. You can put the month or year that you expect to achieve financial freedom across the frame and change it each time you hit a new financial milestone. That makes it even more exciting to see your progress and keep getting closer to the goal! Believe it or not, something this simple really does help you achieve your goals faster. First, it’s written down, which studies show we are 42% more likely to achieve the goals and dreams that we write down. That’s pretty powerful! Second, it puts these images into the forefront of our thoughts. How many times have you finished reading a book or watched a movie and thought about it for days, or maybe even weeks, later? Those images got into your head and you couldn’t quit thinking about them! A vision board works the same way. The images and words will stay fresh on your mind and help you to make choices that support your goal, with or without you even realizing it. Visualization is a real way to channel your thoughts in the direction you want them to go. Make sure you choose images that already make you feel happy, not just materialistic items that you think may bring you happiness. Include anything that inspires and motivates you! Below is our financial freedom vision board. It contains our family picture, which is in the center and that’s our main “why” financial freedom is so important. It will release our family from being burdened by debt. As stated above, financial freedom gives us back time on our terms. Financial freedom to us is zero debt…not even a mortgage. Sure, we will still have financial obligations with insurance, utilities, and normal everyday living but it will be on our terms. We don’t have to have cable t.v. and can use a cheaper streaming service, such as Sling TV (what we have now). We’re in more control of where our money goes instead of being on a lender’s terms! When we originally started this journey five years ago, we set ten years, or the year 2022, to achieve financial freedom. But, once we started budgeting and telling our money where to go, we kept getting closer to this goal faster than we thought. It’s now a 2020 vision! You own your vision board and there is no right or wrong way to create it. You may have more than one for the goals that you want to achieve. 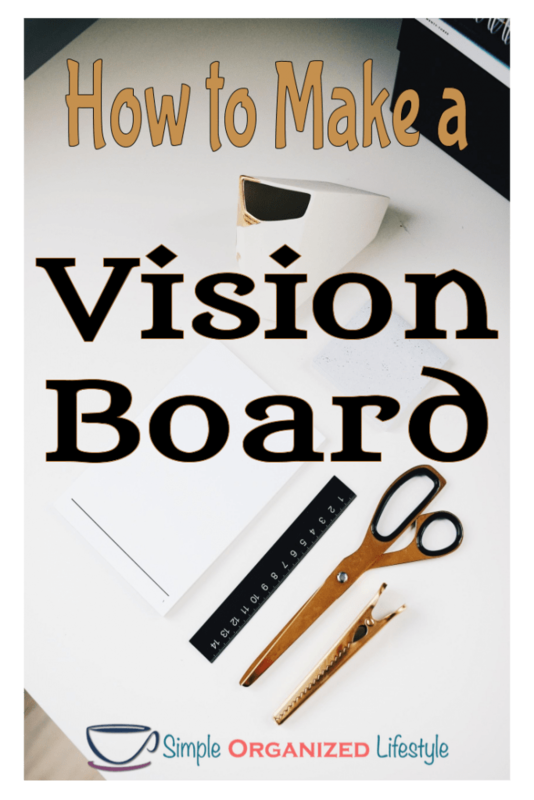 A vision board is great for things you want to achieve personally or professionally. They can change as your goals change. Most important, it’s a visual space that reminds you of your “why” and keeps it at the forefront of your thoughts. Do you already have a vision board? If not, is there one that you would like to create?